On November 2, TSH Deputy Principal, Geoff Reader joined Newman College for a very special assembly. Since 1982 Newman College has supported a comprehensive in-school support program run by TSH for students with hearing loss. In celebration of 36 years collaborating together, Mr Reader presented the school with a commemorative plaque to acknowledge their support of students with a hearing loss through TSH’s Outpost program. 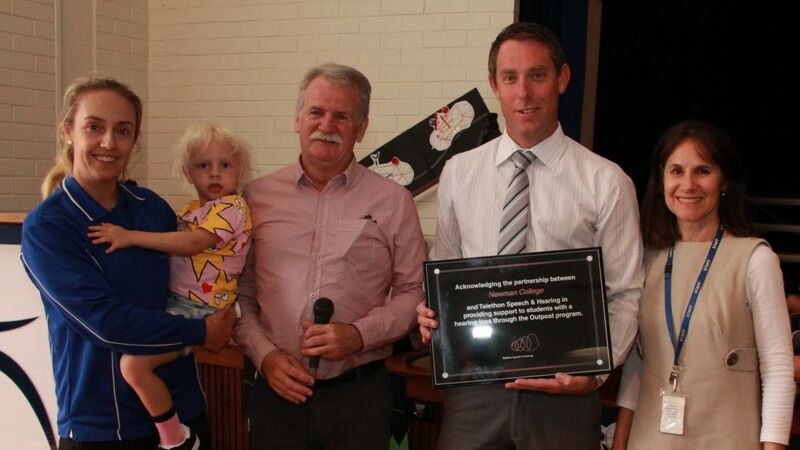 The plaque was received by Newman College’s Head of Primary, Mitch Bristow. Having worked in deaf education for over 36 years, Mr Reader commented that the school had maintained the positive, vibrant energy that he remembers from three decades ago! Telethon Speech & Hearing sincerely thanks Newman College for its ongoing support of the Outpost program and families affected by hearing loss. TSH extends this gratitude to all nine primary and secondary schools within its network. By allowing TSH staff and the program into their school, students with hearing loss have been able to thrive and maximise their active participation in mainstream schools. For more information about Newman College, click here. For more information about TSH’s Outpost program and other school locations around Western Australia, click here.